Way to find GCD - In before post maticschool discuss about how to find greatest common divisor. Now maticschool will proves the second way in before post with problem a larger number. In the second way yesterday we use factor trees to find the gcd. And now maticschool will proves second way in before post with problem a larger number is 100 and 75. 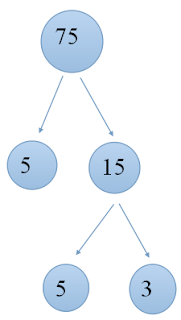 First we determine the two factors with the factor tree. After we know the factors of both. We find the same factors of both these two factors, from these two factors was the same number 5. Then we find the smallest number whose value from the second number 5. Since both number five of the two factors of equal value is 52 . So gcd 100 and 75 is 52 = 25. By using the first way that we described yesterday will also find the same answer is 25. From those two factors there are the same number. Numbers 1, 5, 25 is a factor from both numbers are the same but Greates common divisor is the greatest number that can divide two numbers are depleted. SO the result is 25.